In many developing countries, the number of doctors per capita is still problematically low, meaning patients often don’t have access to the information and expertise they need. We have already seen Totohealth and FrontlineSMS:Medic use SMS messaging to enable patients to communicate directly with healthcare experts, and now AlemHealth are looking to offer their own solution. The company has developed a telemedicine service which could provide a large-scale answer to the problem by linking up hospitals in developing countries with a network of specialists from around the world. 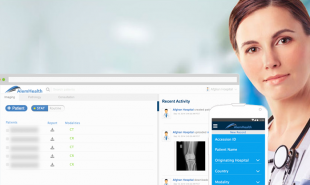 Based in Dubai, AlemHealth currently links healthcare facilities in Afghanistan with specialists from the UK, US, Europe and India via their cloud-based telehealth applications. When a patient visits their local hospital and the staff are unable to provide a diagnosis because of a lack of specialist knowledge, the hospital can put out a request to AlemHealth. The company then passes the request on to their 24 hour network, comprised of hundreds of specialist physicians at global hospitals. The appropriate healthcare professional then studies the case details and provides a diagnosis via email, SMS or hard copy. In emergency cases the whole processes can be completed in as little as three hours. Patients are able to receive accredited, world class diagnoses from their local hospital, while healthcare facilities with bandwidth constraints are able to expand their facilities and services, taking advantage of technological advances in diagnostics without huge monetary investment. Are there similar platforms for other industries, which could give developing countries access to a large network of expertise?